Rainfall data found rain falling at a rate of over 220 mm (8.7 inches) per hour in intense downpours. The storm is now classified as an "intense" tropical cyclone with sustained wind speeds of 195km/h and downpours in excess of 100mm per day. Three successive years of failed rains have left the island nation with crop failure and a chronic lack of food and clean drinking water, nearly 850,000 people are experiencing “alarming” hunger levels. A direct strike on northeastern Madagascar would also lead to a life-threatening storm surge near and to the south of where Enawo makes landfall. Water funneling into Helodrano Antongila Bay could especially put lives and property in danger in Maroantsetra. Tropical cyclone Enawo is bearing down on Madagascar and flooding was already being reported in the north eastern part of the country on Tuesday. Enawo was 70km from the coastal town of Sambava earlier in the day and was expected to make landfall at 10am. Madagascar Weather Service head of meteorology for the Antananarivo region' Anzela Ramarosadratana' predicted flooding in the island's capital city on Wednesday. "There is a red warning for flooding in the north of Madagascar' and there is a flood in north eastern part of Madagascar now'"
"The government will take the responsibility to help the population in the northern part of the country. We estimate that the cyclone will reach the south of Madagascar by the 10th of March. We think that the whole island will be affected by the cyclone." 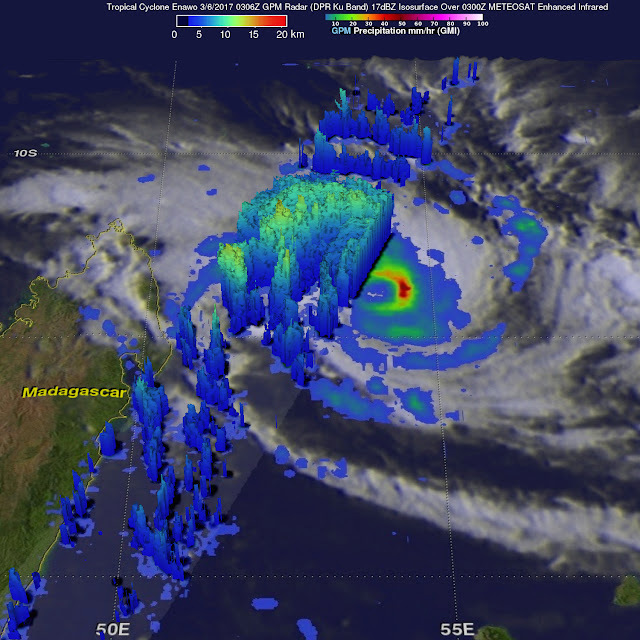 Satellite images show another storm brewing behind Enawo' but the Madagascar Weather Service is keeping an eye on it and does not expect it to reach the island. "We can see on the satellite image that there is another system behind it' but it is not yet a tropical cyclone. It is more south from Madagascar' it is very far and we anticipate that it will not reach Madagascar'" Ramarosadratana said. Three successive years of failed rains have left the island nation wrestling with crop failure and a chronic lack of food and clean drinking water, with agencies warning last month that nearly 850,000 people are experiencing “alarming” hunger levels. “Three hundred and thirty thousand are on the verge of a food security catastrophe, next step being famine,” said Dominique Burgeon, director of emergencies and rehabilitation at the UN’s Food and Agriculture Organisation (FAO).